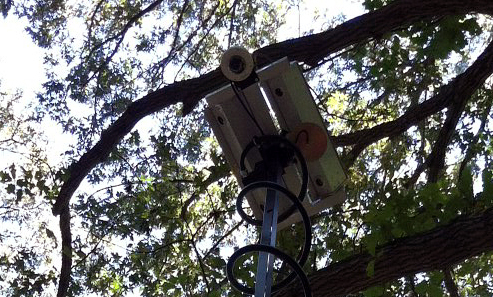 Police in Prince George's County decided there's been enough vandalism to speed cameras. Now there are cameras to watch the cameras. PALMER PARK, Md. – Many people find speed cameras frustrating, and some in the region are taking their rage out on the cameras themselves. But now there’s a new solution: cameras to watch the cameras. One is already in place, and Prince George’s County Police Maj. Robert V. Liberati hopes to have up to a dozen more before the end of the year. “It’s not worth going to jail over a $40 ticket or an arson or destruction of property charge,” says Liberati. Liberati is the Commander of the Automated Enforcement Section, which covers speed and red-light cameras. Since April, six people have damaged speed cameras. On April 6, someone pulled a gun out and shot a camera on the 11400 block of Duley Station Road near U.S. 301 in Upper Marlboro, Md. Two weeks later, a speed camera was flipped over at 500 Harry S. Truman Drive, near Prince George’s Community College. Police believe several people were involved because of the weight of the camera itself. Then in May, someone walked up to a camera on Brightseat Road near FedEx Field, cut off one of the four legs, and left. “I guess that makes a statement, but we were able to just attach another leg,” says Liberati. But when someone burned down a speed camera on Race Track Road near Bowie State College on July 3, Liberati and his colleagues began to rethink their strategy. The Prince George’s County Police Department decided it needed to catch the vandals, or at least deter them. “The roads are choked, there are lots of drivers on them. I think traffic itself is the cause of frustration (towards speed cameras). But, we have a duty to make the roads safe, even if takes a couple extra minutes to get to your destination. Unfortunately, that’s the Washington area, the place we live in,” says Liberati. Speed cameras themselves can’t be used for security because under Maryland law speed cameras can only take pictures of speeding, says Liberati. Liberati says the cameras aren’t a case of Big Brother nor a cash grab, police are simply trying to keep the public safe from reckless drivers.